the French and German victims for the period: February - August 1916 (without acknowledgement). In his book The World Crisis Churchill mentions much bigger numbers, but these are numbers from the entire Western front. The victims fallen outside the Verdun area should not be included. Over the years al lot of numbers have been mentioned. 362,000 French and 336,831 Germans (so nearly 700,000 men) are believed to be killed in the mincer of Verdun (no source). Ernst Glaeser speaks of 300,000 unidentified casualties. Kurt Tucholsky even claims 400,000 French casualties. In his book Le Drame de Douaumont general J. Rouquerol mentions 2,000,000 (sic!) men (French and German) who fell "on the fields that are today lit by the lighthouse of Ossuaire". The Dutch author H. Jonkers takes his data from Rouquerol: 700,000 wounded and 1,000,000 fatalities. The concept "losses" is not very clear. The word applies to every single person who is (temporarily) not available for active duty any more. At the front this would indeed be the dead and wounded, but in the number of losses are included also: missing persons, men with the flu, a pneumonia, an inflammation of the jaw, etc. Even the prisoners of war, who escaped the battlefield in this special way, are included in the number of victims. that the total number of "dead and missing" could be around 180,000, based on a total number of victims of 714,231. German Werth based his numbers on the Sanitätsbericht über das Deutsche Heer of 21 February to 10 September (further data is not available). 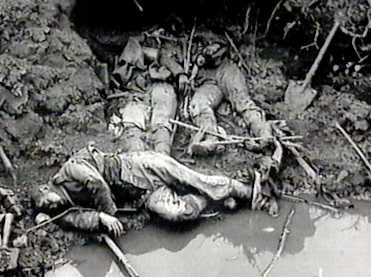 The total number of troop-fall out was 708,524 based on an average of 572,855 men (number of men in the Vth army corps). Of this total fall out 275,770 recovered and 75,000 returned from the military hospital. The total number of losses then adds up to: 708,524 - (275,770 + 75,000) = 357,745 men. (Note: this is still 62.5% of the average number of men in an army corps.) In the end Werth settles for 81,668 German dead and missing. This is 22.8% of the total number of German victims. The French numbers probably have to be adjusted as well. Perhaps they are similar to the German numbers percentage wise. It seems probable that the total amount of victims (rounded off) can be estimated at 358,000 Germans (according to Werth) and 400,000 French. (The French number, as can be found in the first paragraph, is over 10% higher than the German number.) Total amount: 758,000. The number of dead men would then fluctuate between the 22.8% of Werth and the 25% that stems from the normal rate of 1:3. The average is then nearly 24%. The total number of fatalities would then be: 24% of 758,000 = 182,000! (Note: this number does not include the returned prisoners of war. On this there are no accurate numbers available.) However, in reality the losses are even larger than appears from these numbers. You see, included in this number should be as well: the mutilated, the psychiatric patients, the blinded, the crippled, the victims of gas, and all the others who in fact did survive the war, but were not able to function in society ever again.